An Exciting Field Trip to Surendrapuri, Nalgonda. It was regarding the Field Trip to Surendrapuri for primary classes on Nov 11, 2016 (Friday). My husband felt emotional for the way she asked. He immediately filled in the details / acceptance of sending her to the Field Trip and then pinned a 500 rupee note (this was just a couple of days prior to the ban on 500 / 1000 rupee notes) to the pamphlet. My daughter studies in Std II in Chinmaya Vidyalaya, Begumpet, Hyderabad. She was too excited as she will be going on a long trip to Surendrapuri with her friends. On Thursday (Nov 10th, 2016), she came home with a disappointment in her face. The reason, field trip is postponed to a later date. The next day i.e on Friday (Nov 11th), she is back home with excitement and jumped with joy saying that they are going to the Field Trip, the next day i.e on Saturday (Nov 12th). She made her own preparations like cleaning and packing her backpack for the next day's field trip. I dumped few dry food stuffs like biscuits, potato chips and sweet items too. The next day, I got up early in the morning to prepare and pack breakfast and lunch box for my daughter's trip. The reporting time was 8:00 a.m. My daughter too got up earlier than usual and got ready for the trip. By the time we reached school, I could see, as always, parents waiting at the respective classrooms to see off their dear little ones. After a couple of minutes wait, there was prayer and meditation. 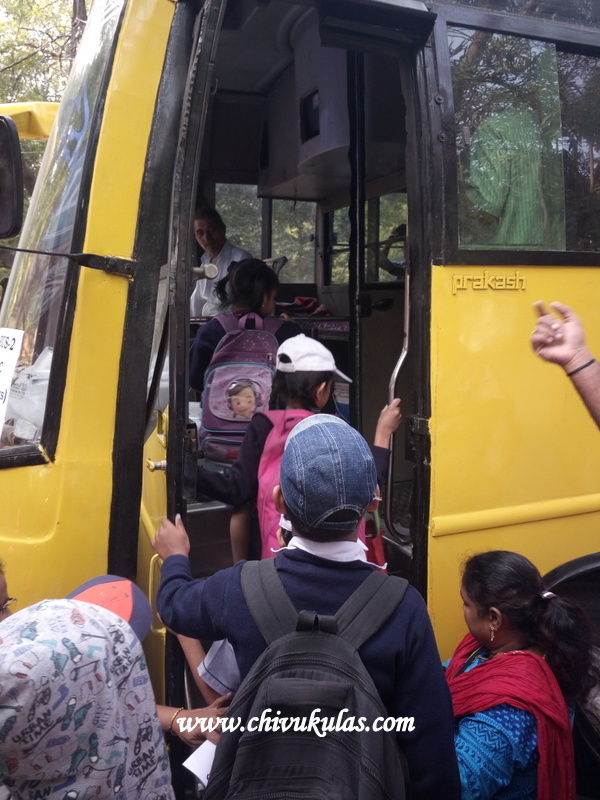 The class teachers took the attendance and on announcement, took the children in lines to board the respective buses. OMG! parents excitement and worry is much more than the excitement of the children. I could see parents giving precautions to their kids, asking them to close the windows of the bus, hold the rod / seat tight so that they don't fall and blaa blaa blaa. As the children were getting into the buses, there were clicks by the over enthusiastic parents. Of course, I'm no exception.I too clicked few while the children were boarding the buses. 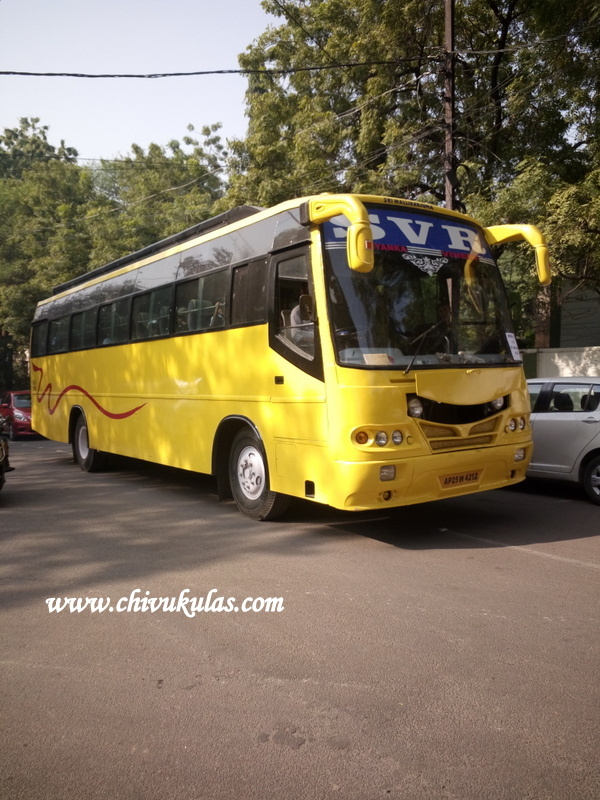 When everything was set and the respective class teachers too board the respective buses, the journey started. Parents waved their hands while the children in buses were too excited as they are going on long drive with their friends. And there the bus in which my daughter is sitting moved. I think, it was around 9:00 a.m, the buses left the school. I was back home and finished my daily chores, all the day thinking of my little one. We reached the Vidyalaya premises by 5:30 p.m and saw some parents waiting to receive their children. As evening time is the rush hour, the buses reached the school late. The premises was crowded with eagerly waiting parents. 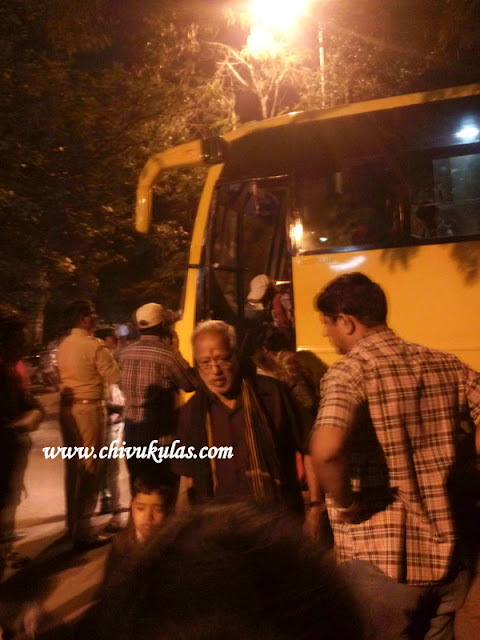 The buses started reaching Vidyalaya premises one after the other and the parents rushed to the spot to receive their tired kids. By the time, my daughter was back to school, it was around 7:30 p.m. I could see the happiness / satisfaction on the faces of the children. They too were eager to explain everything to their dear parents. On the whole, the primary class children (from Classes I to V) had a culturally enriching and exciting field trip to Surendrapuri near Nalgonda. Back home, my daughter (and of course the other children too) refreshed herself, had early dinner than usual and went to bed early. She had a sound sleep and could be with wonderful dreams of the trip. On Nov 14th, 2016, she had a memorable moments of Children's Day Celebs at Raj Bhavan meeting our State Governor Sri Narasimhan. Surendrapuri earned fame for being the Centre for Mythological Awareness specially Hindu Mythology. It is also known as Kunda Satyanarayana Kala Dhamam and is located at a distance of around 60 Km from Hyderabad. There are replicas of important Hindu temples and sculptures depicting Hindu Mythological Stories like Ramayana and Mahabharata. Well, a school field trip is always a welcome break for the children from their regular routine school life which is full of books and writing. They spend the day in a different learning environment. Field trips help them to learn to do things independently and carefully too. It gives them a different interactive experience.